Leh has quite a few interesting places to visit. You can start from the captivating Leh Palace that rises from the edge of a hill overlooking the town and stretches out towards the indigo sky. Irrevocably reminiscent of a picture-postcard of Lhasa�s Potala Palace, this deserted edifice has a definite mystical quality about it. The Palace was built in the middle of the 16th century by King Singe Namgyal and still belongs to the royal family that now lives in the Stok Palace. The nine-storeyed monument has gone to seed, so don�t visit the site expecting too much. You might not be able to get in at all as the palace remains locked, unless of course you ask around and find a monk who can open it for you. The Palace has a museum with some tangkhas (painted or embroidered scrolls) and paintings amongst other things. The view from the monastery is quite impressive. Roosted above the Leh Palace is the Namgyal Tsemo Gompa (monastery). The enigmatic stark structure stands on a steep hill looming over the town. Built in 1430 by the Namgyal rulers, the red monastery has some frescos, Buddhist scriptures, idols and a massive statue of the Maitreya Buddha (future Buddha). The splendid view from the top alone is well worth the effort. The striking Shanti Stupa is a recent structure. A Japanese who harboured the ambition of spreading Buddhism across the world, had it constructed in 1985 with aid from the Japanese Government. 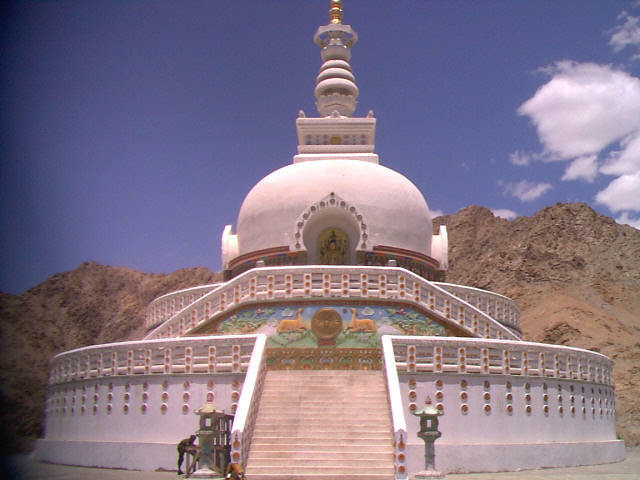 The stupa is connected by a �motorable� road and a steep flight of stairs. Once on top, you can stop for a snack in the tea shop, then relax and enjoy the panoramic view of the chain of mountains and the peaceful little village of Changspa with typical Ladakhi houses built along a gushing stream, and the towering Namgyal Tsemo.There is a rudimentary Sauna Spa not far from the Shanti Stupa in Changspa Village that offers a soft drink in the sauna! The striking green and white Leh Mosque in the Main Bazaar is also worth a visit. The mosque is open only to men. This is also a good place to find out about the possibility of doing voluntary work with various organizations. If interested, inquire at the reception centre or simply check the information board. Leh offers some delightful walks, especially around Changspa Village. Just take any of the cobbled lanes in the village and feel free to carry on as you please. It is impossible to get lost in this tiny village. The lanes and by-lanes curve around colourful Ladakhi houses with brightly-painted windows overlooking little gardens blossoming with cosmos, poppies and hollyhocks. The village is dotted with prayer wheels where you might see some locals turning the symbolic wheel. A network of narrow canals channel the river water to all parts of the village, so you can never be far from the gurgling sound of flowing water and patches of wild arises growing around the banks of the canal. Bunches of little children with sun burnt rosy cheeks and sparkling eyes will greet you all around the village with the all-encompassing greeting jule (hello, bye, thank-you and please) that you must be all too familiar with by now. In case you do feel a little lost or disorientated, just ask any local and he will be happy to show you the way. 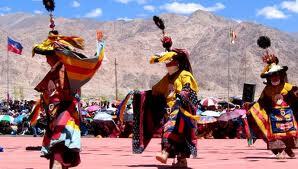 The Buddhists of Ladakh celebrate Losar as their new year. Before the rule of Jamiang Namgyal (1555-1610), this day was considered to be the first day of the Ladakhi Buddhist year, which is based on the moon and sun similar to that of the Hindus. However, Losar was advanced by two days as Jamiang Namgyal decided to invade Skardu before the new year. Since then, Losar is celebrated on the last two days of the l0th Bodhi month, which coincides with December of the Christian calender. Losar is celebrated with traditional gaiety and fervour. The festivities include illuminations, drinking, dancing, singing and general merry-making. Men come out of their homes with torches of wood which are whirled round and round. People visit each other's homes during these celebrations, which continue for many days. The fifteenth day of the first Bodhi month is celebrated as a festival marking Buddha's entry into the womb of his mother. Prayers are held both at home and in the gompas. The fifteenth day of the fourth Bodhi month is the day when the Buddha is believed to have taken physical birth. The people fast on the Jipe Chonga day. Homes and gompas are illuminated and special prayers are conducted. 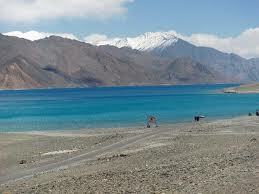 Ladakh supports a total population of about 1,40,000 according to the 1981 Indian census figures. 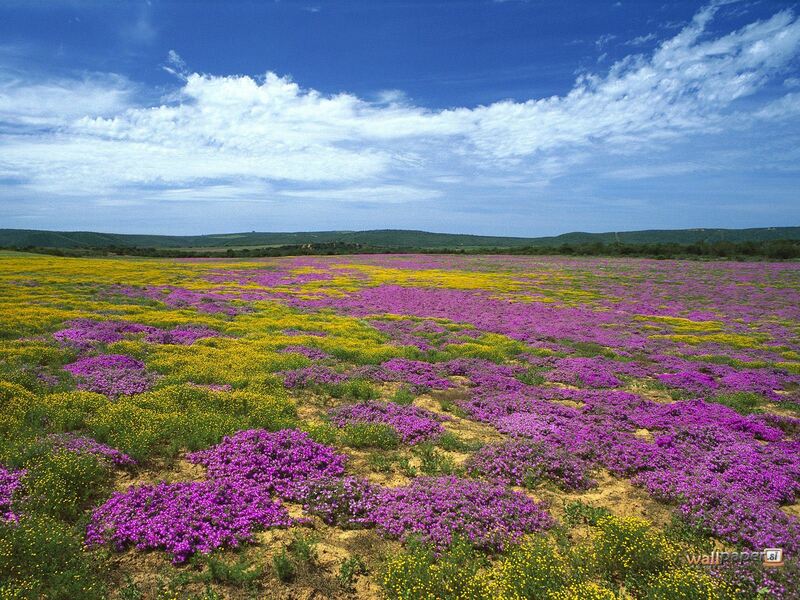 This region has one of the lowest population densities in the world with a little over 2 persons per square kilometre. 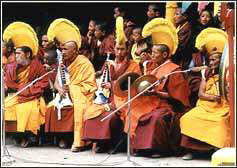 A considerable proportion of the population of Ladakh consists of Buddhists. They are the main inhabitants of this region.The Buddhists may further be divided into different sub communities depending on their culture. Located on the Leh-Srinagar highway, the Lamayuru Gompa dates back to the 10th century and is known to be the oldest house of faith in Ladakh. 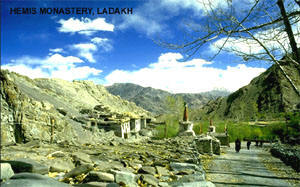 The monastery is also famous for being one of the most picturesquely-located monasteries in Ladakh. It belongs to the Kagyupa order of Buddhism and is believed to have been wrecked and reconstructed several times. The monastery is home to some of the finest frescos, carpets and tangkhas (embroidered or painted scrolls) you�ll see in the region. The prayer ceremonies in the gompa should not be missed. Amongst numerous other monasteries that dot this rugged landscape, the Shey Gompa at a distance of 15km from Leh was the former summer residence of the royal family of Ladakh. 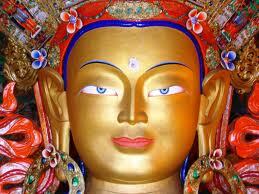 The monastery has a 23m high gold-plated Shakyamuni Buddha statue, known to be the largest one in Ladakh. The Spituk Gompa is only 8km from Leh and overlooks the Leh airport while from the back of the monastery one can look down on the winding Indus and a sprawling green village topped with willows and poplars. The monastery has some noteworthy statues of Buddha and a natural rock formation of the Hindu goddess, Kali. Another monastery close to Leh is the Stok Gompa built in 1814. In the year 1974, the last king of Ladakh passed away in this monastery. The monastery faces the Stok Museum that has, amongst other things, a collection of the royal family�s traditional clothing and jewellery. The deserted 400 hundred year old Basgo Gompa close to Nimmu Village houses fine frescos and a gold-plated statue of the Maitreya Buddha. The hilltop monastery offers a spectacular view of the surrounding landscape. Further on, the majestic Likkir Gompa built in the 14th century is famed as the first monastery built by Tibetan monks and is definitely worth a visit. Today, the monastery follows the Gelukpa Order of Buddhism. 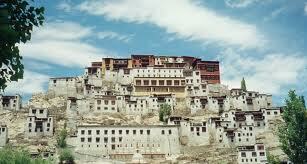 The monastery is also called Klu-khyil Gompa or the Monastery of the Spirits of Water.